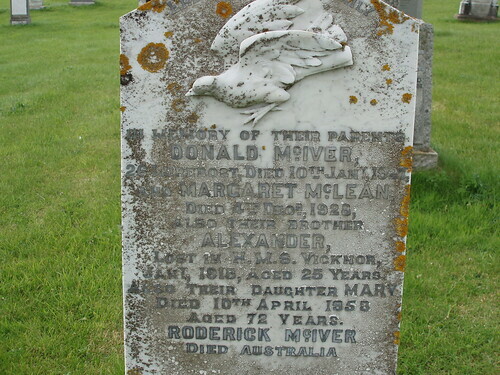 Son of Donald and Margaret Maciver, of 26, Luerbost. Alexander appears in the 1889 census, aged 1, the son of Donald (45) and Margaret (34), and grandson of Roderick (81) and Ann (74), at Trantom Cottage. Also present are his siblings Mary (10), Isabella (5) and Ann (4). A decade later, Johanna (8), Murdo (6), Roderick (5), George (2) and Donald (6 months) have joined the family; grandfather Roderick is aged 90 by that time. 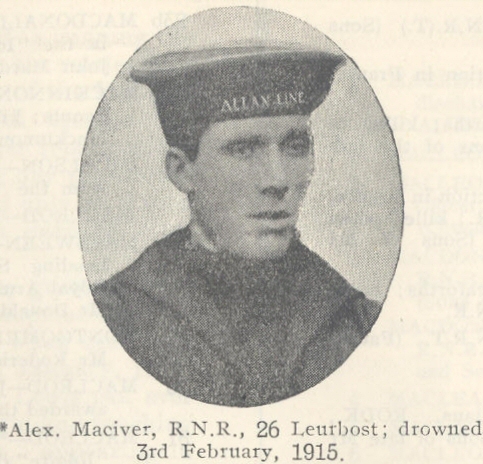 His brother Roderick served in the Gordon Highlanders, and Murdo was in the RNR. These two survived the war.